Sorbus commixta is a deciduous tree with a rounded, bushy habit. Its mid green leaves are odd pinnate with up to 17 leaflets and up to 30cm long. 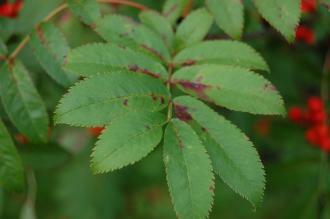 Its leaflets are lanceolate with serrate margins, up to 7cm long and 25mm broad. Its leaves turn orange/ red/ purple in autumn before they fall. Its bark is light brown to silver/ gray. Its cream/ white flowers are up to 1cm across and are produced terminal corymbs which are up to 15cm across. Its red fruit is a pome, up to 8mm across and mature in autumn and may remain on the tree during the winter months. 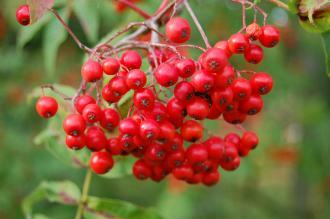 Sorbus commixta, commonly known as the Japanese Rowan, is native to Japan and the far east of Russia. In its native habitat it grows on mountain slopes. 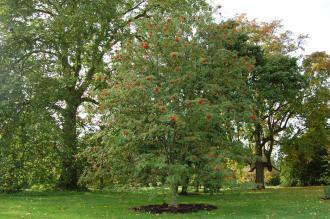 The etymological root of the binomial name Sorbus is from the old Latin name for Sorbus domestica (Service Tree). Commixta is derived from the Latin commixtim meaning ‘ jointly’. The landscape architect may find Sorbus commixta useful as a small attractive tree with spring flowers, interesting autumn leaf color and autumn to winter berries. This tree is tolerant of atmospheric pollution. Ecologically, Sorbus commixta flowers are attractive to pollinating insects. Its fruit are attractive to some bird species. The Royal Horticultural Society has given the varieties Sorbus commixta ‘Embley’ (1993) and Sorbus commixta ‘Dodong’ (2012) their prestigious Award of Garden Merit. Sorbus commixta prefers moist, fertile, well-drained soils. It prefers a neutral to acid pH of soil. Sorbus commixta requires little maintenance. Any pruning should be carried out in late autumn to winter.